Toby Harris is co-chair (with Janet Heineck and Rita Frischer) for the 2010 AJL Convention that will take place in Seattle, WA, July 4-7. She is the president of AJL's Northwest Chapter, and librarian at Temple De Hirsch Sinai. Toby, what are some of the most exciting things planned for the 2010 AJL Convention? Can you give us some highlights? There are so many sessions I’m excited about! We have a couple of off-site choices which will give some an opportunity to see a bit of Seattle and I’m very excited to show off our city! One is the Seattle Public Library, a mere two blocks from the hotel with quite dramatic architecture and bold ideas. There, we’ll get a tour and get to use their computer lab classroom. The other is a visit to Seattle Hebrew Academy, an incredibly beautiful historic building set in a Northwest forest, with an award winning library. I am struck by the range of interesting settings our presenters work in. Hearing about challenges for the National Library of Israel and Yad Vashem, the many special collections and resources at Columbia, Yeshiva, Stanford and here at the University of Washington, along with some bookdealer perspectives and those of us building community in our synagogues and day schools. A big focus will be on examining our users, planning and making digitization and technology choices. And of course, those fabulous book critics and Sydney Taylor award-winning authors will be ever present! Our keynote speaker, Dr. Joseph Janes, Associate Professor in the Information School of the University of Washington is supremely engaging and witty, and he’ll share his passion for reference, innovation and our digital world. He’s the founder of the Internet Public Library and writes the Technology column for American Libraries. Those night owls who want to venture out Sunday night to watch fireworks over urban Lake Union will view a wonderful display of good ole July 4th spectaculars. And those arriving earlier on Sunday get to be there for an afternoon of music, poetry and exhibits in the elegant Spanish foyer of the hotel. Planning the convention must be a huge job. What have been some of your best and worst experiences in getting ready for convention? Well, it’s not over yet so I’d like to reserve that question! It definitely takes many people to pull together but I can already feel the rewards coming! Studies have shown that Seattle is the most literate city in the nation. What makes Seattle such a great place for reading and libraries? The gray skies might help a bit. Mainly we’re just a bunch quirky characters who love to learn and escape! We have lots of independent bookstores here which seem to be surviving just fine and we do love our incredible libraries! Can you give us a recommendation for some of your favorite Jewish books? Two of my favorite Jewish adult books which haven’t yet lost their standing are A Pigeon and a Boy, by Meir Shalev, andThe Book Thief, by Marcus Zusak. I loved Shalev’s brilliant and meaningful story and need to read more books written by him. And one of my fondest AJL convention memories is when I got to meet charming and handsome Marcus Zusak! Aside from his charms, looks (and accent), what makes Book Thief so wonderful is its unique perspective and outsider look at the Holocaust. 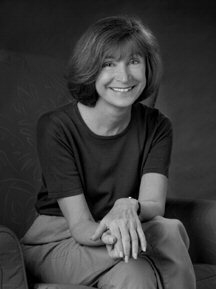 Another book that has stayed with me for several years is Anna in the Afterlife, by Merrill Joan Gerber, the last of her Anna Goldman series, and the best in my opinion. I can spend a lot of time gazing at the cover art on this raw and expressive book while thinking about people in my own life. Not recommended for the faint-hearted. The Seattle area is the home of both Amazon and Apple. What’s your preference, Kindle or iPad? What are your feelings on digital books? I still prefer the feel and look of a real book and all of its details! I do appreciate some of the features and portability of digital books and can see they have their place but I have no interest in acquiring one yet. What Seattle experience should visitors be sure not to miss? And what’s your favorite vendor at Pike Place Market? Besides the Market, which is a must, the Space Needle allows you to see the whole layout of the city and is quite remarkable. Seattle buses are free downtown which makes it easy to explore that area! The Ballard Locks are very impressive, especially if you like boat watching. And of course, I highly recommend one of the tour options: Seattle’s old Jewish neighborhoods led by Washington State Jewish Historical Society or Seattle’s native trees and plants in the Washington Park Arboretum. Toby, thanks for kicking off the Convention Countdown! We can't wait to visit with you in Seattle! Enter the Mention Convention weekly drawing for a $10 Amazon gift card by linking back to this interview during the week of May 9-15, 2010 on your blog, on Facebook, or on Twitter (hashtag #AJL10) -- just emailpr@jewishlibraries.org to show us what you did! Today we have for you an interview with Elana MacGilpin, one of the organizers of the Mandell JCC Jewish Book Fest, an event made up of several book events, that takes place every year in Hartford, CT.
Tell us a little about the Mandell JCC. How many members do you have? What other kinds of activities do you sponsor? The Mandell JCC is a community of people of all ages, stages and beliefs who share laughter, learning, listening, and leading. Members are part of a "neighborhood" where minds grow more active, bodies grow stronger, and friendships grow exponentially. On the main campus in West Hartford, CT you will find a range of fitness, recreation, education and cultural facilities including a new fitness center, a cultural center, a preschool, an aquatics center, a theater, a family room, an art gallery, a lecture hall and a physical therapy center. Off campus, the Mandell JCC includes two seasonal recreation/educational facilities - a waterfront summer camp in the woods and a suburban swim and tennis club - and two satellite preschools. The Mandell JCC is a Jewish community open to everyone regardless of faith, who value caring for and sharing with each other. It is a place that is warm and inclusive and we have 2720 membership units or about 7200 members. Tell me a little bit about the Mandell JCC's Jewish Book Festival. When is it held? What kind of speakers or authors did you have? How many people attended? The Mandell JCC Jewish Book Festival is a year-round series of four Signature Events that usually take place in November, January, March and May. We also sponsor a program called Authors on the Road where we partner with synagogues, Jewish agencies and schools to host authors outside of the JCC - this is year round as well and add about 8-10 events per year. We switched to this format in the 2007-2008 series and have hosted Carl Bernstein, Jodi Picoult, Dennis Ross, Martin Fletcher, Jennifer Weiner, Michael Chabon, to name a few. We host authors who are Jewish or who aren't Jewish themselves but write on a Jewish topic. The celebrity/marquee authors that we have featured has really heightened the profile of the Festival and we have welcomed over 2000 participants a year. 3. I noticed on your website that rather than having one continuous event, for a week let's say, the Mandell JCC breaks it up over several months. Why? What advantages does this approach present? We worked with the traditional Festival model for 14 years and decided that in order to give it some fresh ideas and a fresh perspective having four major events throughout the year with authors who are household names would accomplish this. It gives us the opportunity to provide something for everyone on a schedule that fits better for our audience members who lead busy lives. With the traditional model if you happen to be on vacation for that week, or have other family or work commitments, you lose the opportunity to participate - with the year round model if you miss one event, you can still be present for the rest. We sell tickets to individual events as well as for the series. What were the highlights from the 2009-2010 season? What was your most well-attended event? What kinds of feedback do you get from the community? Our kick off event featured NY Times Bestselling Author Alice Hoffman in conversation with RJ Julia Owner and West Hartford native Roxanne Coady. Our festival established a new partnership with RJ Julia this year and are so thrilled to be working with them. Our most well attended event of the year happened on November 5 with Mitch Albom. His newest book, Have A Little Faith, was #1 on the New York Times Bestseller list when he spoke in West Hartford which was such a thrill - we had 650 people in the JCC that night and had to move the event from our theater which seats 400 to our gymnasium! In January we hosted Rabbi Joseph Telushkin whose new book - The Code of Jewish Ethics: Love Your Neighbor as Yourself - was presented. This event happened on the heels of the devastation in Haiti and the theme of Rabbi Telushkin's talk really resonated with participants. Our final event was on April 13 with Oprah favorite Chris Bohjalian. His book Skeletons at the Feast is based on a real life diary about a young woman in Germany at the end of World War II and pulled in characters who were fighting for their lives during the Holocaust. This event was held just after Yom Hashoah so it was very meaningful. How is the festival supported? Who organizes it? Does the Festival have paid staff and/or volunteers? The Festival is supported by corporate and community sponsors who have been very generous over the years. The Mandell JCC is the overall organizing body and I serve as the Director. I work with an outstanding volunteer committee comprised of JCC members and community members who are passionate about literature and Jewish culture. This amazing team spends countless hours throughout the year, working on every details to ensure that our participants have an enlightening experience with our featured authors. What do you have coming up for the 2010-2011 season? We are in the planning stages for the 2010-2011 season so we don't haveanything to announce just yet. Myself and three members of our steering committee are attending the Jewish Book Council conference in New York City where we will hear from over 200 authors. We have our wish list as well and will announce our season mid-summer. We will also be launching a new book club initiative with an event in October where Roxanne Coady from RJ Julia will come talk to book club members, give them tips on how to run a successful book club, talk about her favorite book club picks and will give the participants an opportunity to shop for books as well. It is going to be our 18th season so we will surely be planning something special. What tips or do's and don't's would you offer to JCCs or small organizations looking to put on their own book festival? In my experience, working with a volunteer committee who is as committed and dedicated as the staff is so important. Authors come and go but engaging your members and the community can lead to years of success. Certainly knowing your community is also key - like if your community only likes household names or has interests in specific themes. Being a member of the Jewish Book Council is also a great way to expand your access to and repertoire of Jewish literature and authors as well make connections to staff at JCCs and organizations who run their own Jewish Book Festivals. Their website is www.jewishbookcouncil.org. Elana, thank you so much for taking the time to talk to AJL and share your successes. Mazel tov and best of luck for the future! I hope you keep us posted about your activities! Krensky, Stephen. Hanukkah at Valley Forge. Illustrated by Greg Harlin. New York: Dutton Children’s Books, 2006. ISBN: 0525477381. Michelson, Richard. As Good As Anybody: Martin Luther King, Jr. and Abraham Joshua Heschel’s Amazing March Toward Freedom. Illustrations by Raul Colon. New York: Alfred A. Knopf, an imprint of Random House Children’s Books, 2008. ISBN: 9780375833359. Rael, Elsa Okon. When Zaydeh Danced on Eldridge Street. Illus. by Marjorie Priceman. New York: Simon & Schuster Books for Young Readers, 1997. ISBN: 0689804512. 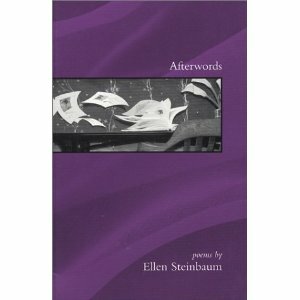 On the last day of National Poetry Month, I have for you today an interview with Boston-area poet Ellen Steinbaum, Pushcart-nominated author of Container Gardening and Afterwords. 1. Tell us a little about yourself. How long have you been writing? Who or what influences your work? What poets do you love to read? I have always been a writer. As a child I wrote a family newspaper (which was a little pathetic since I was an only child, so there wasn't much news, but I persisted). For much of my life I wrote magazine and newspaper articles and then later found myself drawn to the idea of what I could do with poetry that I couldn't do with prose. Influences include my teacher, Ottone Riccio, and contemporary poets like Linda Pastan, Gail Mazur, Ruth Stone, Marie Ponsot, and Dorianne Laux who combine "the materials at hand"--details of daily life--with careful craft. I also love the work of Galway Kinnell, W.S. Merwin, and Richard Wilbur who does rhyme so elegantly that it looks effortless. Emily Dickinson and Walt Whitman--two very different poets whose work intrigues me. And the sound of Gerard Manley Hopkins' poems is so wonderful. Keats...Mark Doty...Wislawa Szymborska...Edward Hirsch. Yeats. Yehuda Amichai. Octavio Paz. So many--depends whose work I've read most recently. And two friends whose poetry I greatly admire and enjoy, Susan Donnelly and Patricia Smith. 2. What is your approach to or style of poetry? Do you think it's important to have a style or define yourself within a movement? Does it limit or expand what you can do? Obviously, when you write poetry you're going to be aware of what other poets are doing and of the long tradition you are part of. But my concern is more on doing my own work than on figuring out where I fit in. I'm just concentrating on writing in an authentic voice and trying to make it as clear and true and precise as I can. One thing I do want to mention is what I visualize as almost the collaboration between poet and reader. I know there are poets who feel that the poem exists only as they intend it to, but I don't entirely. I believe the poet has his or her intentions, but readers come to the poem with their own set of attitudes and experiences and so what the poem is varies a little from reader to reader. It becomes at some level a combination of the original intent and the received thing. It's a huge gift to a poet to have readers willing to bring themselves fully and respectfully to the work. It's humbling. I am always grateful when readers tell me that my work has meant something to them. 3. Onto the poems themselves, which I loved. My favorite poem in Container Gardening is probably "Gathering," about using shells collected by speaker's aunt to mark her grave. Can you talk about some of the themes in this lovely poem? Thank you! I am writing this, actually, on the birthday of that very dear aunt. Primarily what I was thinking about when I wrote that poem was how the small pieces of our lives that, at some point, have real meaning to us, get lost to ourselves and to others. They just melt away, the way we forget where the stones were from. We think we'll never forget this experience, and then we forget, though of course something of it remains with us. And when the stones and shells are someone else's, they show how impossible it is to really know another person's life. No matter how close you are to that person, there are always mysteries. 4. In the first poem, "Standing at the Shore," the moment described- people on the beach, children rooted but striving for freedom- starts as "soft"- "the same soft moment"; later, it's "that messy instant." Why the change? Is the moment soft and messy at the same time? The softness, I guess, is the light just at dusk, the quiet on the beach, and everyone concentrating on standing there and looking good for the photograph. At least the adults are feeling that. But the children always have another agenda. While the adults are thinking about preserving the moment, the children are busy living it, squeezing the juice out of it. But I hadn't actually thought about that before. (This is why I knew it would be fun to answer your questions--they make me think of new things about my work and about poetry in general.) What I was thinking about--or at least what I thought I was thinking about when I wrote this was time and impermanence, which is probably what I am often thinking about when I write. 5. In the first part of the book, dominant themes include loss, memory and history, and the poems are deeply personal. In the second, the tone is somewhat more political with mentions of wars, terrorism and allusions to first-world privilege; still, the poems are rooted in day to day life. In the third section, there's a hint of menace as we move from the past through the present and into the future- an idea that the future is a dark place. Can you talk about this progression? Is there optimism as well or is it all bad news? I didn't think of it as menacing, but rather just as life with its certainty of pleasures and sorrows. When I named the book Container Gardening, I was thinking of how we construct our own little universes to live in. Partly they're private, built out of our own experiences. Partly they are touched by the larger world we live in, and that's where the political poems come in.But then--and I guess this is that third section--we take those pieces and go forward with our lives into whatever happens next. And we hope that some of what happens will bring us joy. And we know that some of what will happen is bound to bring us sorrow, simply because we are mortal beings connected to other mortal beings. And all we can do, I think, is muddle through the best we can. There's a Jewish saying I read once about the idea that at the end of our days we will be called to account for every fruit we did not taste in its season. That is often in my mind and I hope that's what that third section is about, the sense that with all the certainty of sadness, we still can--must- notice the joy. As the last words of the last poem say, "rest within the wonder/of this gift." Thank you so much for agreeing to participate! This interview was originally posted at the weblog Boston Bibliophile as a part of the National Poetry Month Blog Tour, hosted at Savvy Verse and Wit. Visit Ellen at her site, www.EllenSteinbaum.com. 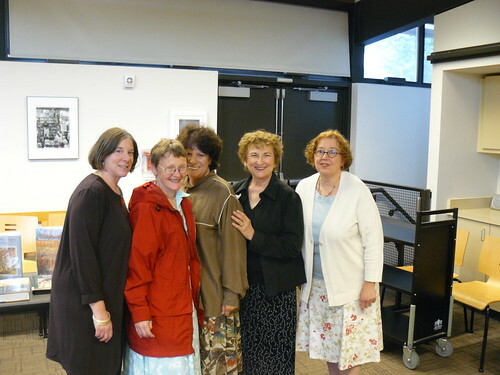 Sunday, April 18, 2010, the 7th annual Western Regional Conference on Jewish Literature took place in Los Angeles. This year, the conference, cosponsored by AJLSC, SInai Temple Blumenthal Library, and American Jewish University, piggy-backed on the Skirball Cultural Center's exhibit, "Monsters and Miracles-- a Journey through Jewish Picture Book Art." With about 70 participants, the conference brought together Judaic and non-Judaic librarians, teachers, authors and illustrators as they all joined in their appreciation of the art of illustration in children's books. Panelists Richard Michelson (Sydney Taylor Award winning author and gallery owner Eugene Yelchin (illustrator and member of the Jewish Artists Initiative), and Joni Sussman (publisher of KarBen Books) shared their views on putting picture books together. Joni also read manuscripts of hopeful authors and gave advice on how to ready these manuscripts for publication. A silent auction and book sale allowed conference attendees to bid and purchase some picture book art for themselves. The highlight of the program was a talk by exhibit curator, Tal Gozani, and visit to the exhibit at the Skirball. Everyone left asking when the next conference will be!